Carrara markets are the major weekly organized shopping and entertainment center in Carrara. Everything, right from farm fresh veggies to the dairy products, brand new to second hand things-all are available at the same spot and the market is well planned keeping in view a perfect holiday for the whole family. There are many eateries, cloth shops, fun rides and other hangouts inside the market. Their attractions include Luke’s reptile kingdom which is a live reptile show of many species of snakes, lizards and Crocodiles. Wheelchair and baby strollers accessible. Public toilets are there inside. Separate parking for differently abled people. Please do not take your pets inside. Nerang Broad beach Rd at Nielsen’s Road. Gooding Drive at Merrimac Golf Course. You can also take a tram to the Broad beach North station or Northcliffe station. Hire a taxi, or walk down to the place. Love this? Explore the entire list of places to visit in Carrara before you plan your trip. Fancy a good night's sleep after a tiring day? Check out where to stay in Carrara and book an accommodation of your choice. How popular is Carrara Markets? People normally club together Super Duck Adventure Tours and Purling Brook Falls while planning their visit to Carrara Markets. People also prefer to start their day with Carrara Markets. These are great markets. If you don't find what you're looking for here it probably doesn't exist. Best bacon and egg rolls as well. Great stuff for the kids too. One time there were classic cars on show but we haven't seen them there since. Would be great if they had them there again. Just have a wander around and see what you think? Awesome place lots of goodies at really cheap prices. Something the whole family can enjoy. Will definitely be going back again. Lots of beautiful food to choose from. People with stalls were very nice to talk to and very helpful. All in all a great day out for the family. Love these markets on Sundays! I enjoy the boot sale that goes on as well. Would recommend checking them out if you're in the area. They have a nice garden section in the front that I bought some great plants from. This is a great market which has been here for many years. 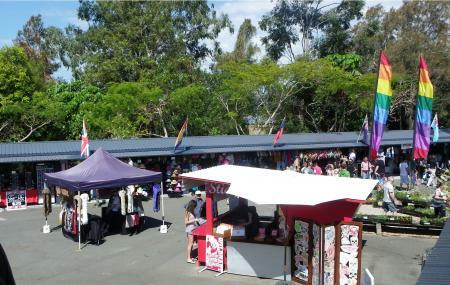 There is a good variety of stalls, with many bargains to be found. Plenty of parking available and many areas undercover. Open on weekends only, a good activity for a day trip, with many cafes for lunch. Worth a visit. We had a lovely day until this guy the owner of danny at the markets, thought it was funny because my pregnant wife found a dirty hair in her food and when we asked for them to please make us a new one the boy serving us gave us our money back and told us there was a new one coming. After waiting for 15 minutes after I had finished my meal , I asked where her food was . He told me as we found a hair in our food he gave us our money back and to go somewhere else . When I explained that the kid said we were told they were making us a new one . He said that the kid was going to be fired and if he gave us a new meal it was coming out of his wage . Myself and my wife have never been treated like that ever in Australia and therefore will never go back to Carrara markets again!! !